Deleting iMessages on iPhone is the common trouble you may come up. Losing iMessages can cause a lot of problems. Luckily, iMessages and text messages can be backed up to iCloud. However, you cannot view the iMessages conversation and attached images unless you restore your device with the back. Thus, how to restore iMessages from iCloud? In this article, we will show you two methods. If you back up your iMessages on iCloud regularly, you can restore the whole iCloud backup including iMessages with below steps. 1.Tap on the setting icon. Then go to general. Follow through to Erase all content and settings. This step will remove all the details on your device, and hence you will have to set it up again. 2.Restart the phone and follow the initial steps you used when you bought it until you reach the App & Data setting. 3.Select Restore from iCloud Backup. Ensure that the iCloud backup contains all the messages you deleted. There you have it. Let your iPhone restore the backup, and you will access all your initial iMessages. However, to get back iMessages by restoring iPhone from iCloud backup will overwrite the current data on your iPhone. And one more disadvantage: if you want recover just some iMessages instead of all the data, this method may not be suitable for you. In the second part we will introduce a useful method by which you could recover only the iMessages you need from iCloud to computer without resetting your device. 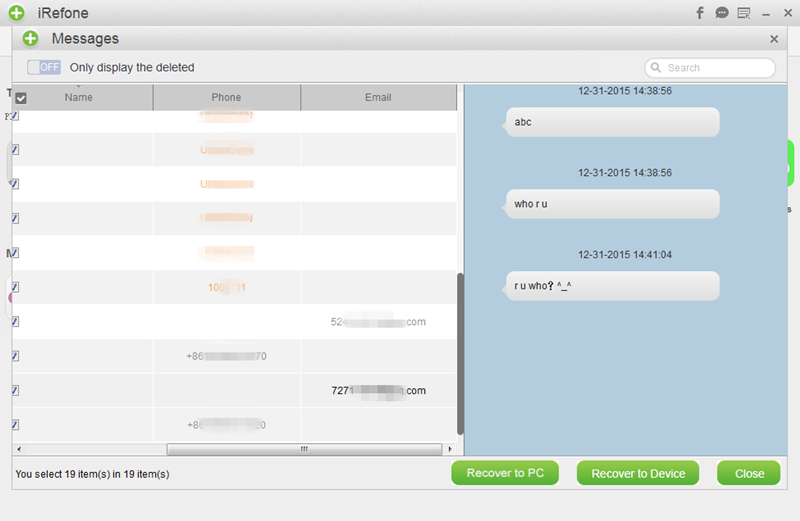 If you have iCloud backup and only want to restore the messages in it, iRefone would be a good choice. -You can separately backup and restore messages, WeChat or WhatsApp. -You are also able to back up data from iPhone without overwriting the previous Backup. -You can restore data from iTunes/iCloud and iRefone backup. -You will also be able to extract 16+ data types from back up files or iOS device. 1.Run iRefone and connect your iPhone with computer, then choose the recovery mode option for “Recover from iCloud Backup”, and enter your Apple ID and password to log in to iCloud account. 2. You can find all iCloud backup backup files in your iCloud account. Choose one iCloud backup you need to recover data and click “Download” to start the download of your iCloud backup. 3. When the downloading is finished, it will ask you choose the data you want to preview, just click on the Messages icon. 4. Finally, Preview these messages in the software and choose these one you need, click on “Recover to Device” to transfer these messages to your iPhone.